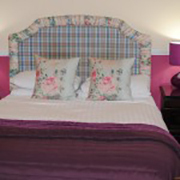 Welcome to Kincaid House Hotel, a country house in Milton of Campsie. Kincaid House Hotel in Milton of Campsie, is a charming Grade ‘A’ listed country house set in its own grounds and reached by a winding, tree-lined driveway. Located in the village of Milton of Campsie, at the foot of the Campsie Fells, this traditional and elegant 10-bedroom, privately-owned and family run hotel combines peace, quiet and excellent hospitality allied to travel convenience, with Kirkintilloch, Lenzie and Bishopbriggs all close-by. Glasgow’s commercial and renowned cultural shopping areas plus all its other cultural and entertainment attractions are a 15 minute car journey away – and links to both Scotland’s motorway network and tourist routes are straightforward. The hotel has undergone substantial and extensive restoration and retains its distinctive appearance and appeal. Our friendly and highly efficient staff want to make sure your stay is as pleasing as possible whether you’re on business or on a break.